Austin, Texas, is a town that famously prizes creativity and innovation — but also takes its heritage seriously. 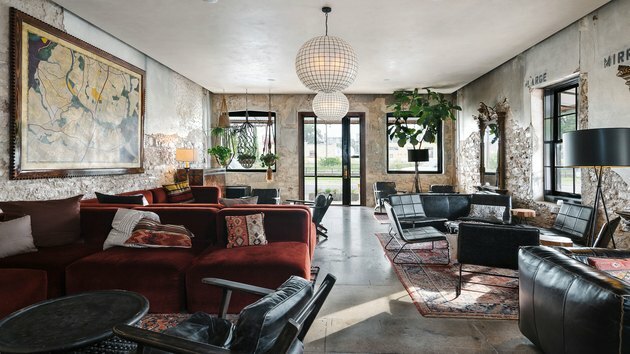 So when Jared Haas of un.box studio was hired to reimagine a 19th-century building as the Native Hostel, a multifunctional hostel, music venue, and bar, his challenge was to unify tradition and nonconformity, past and present. "The fact that this building was originally built in the 1890s, and added on in the 1940s, was incredibly important," Haas recalls, which was true for the team, and the locals. 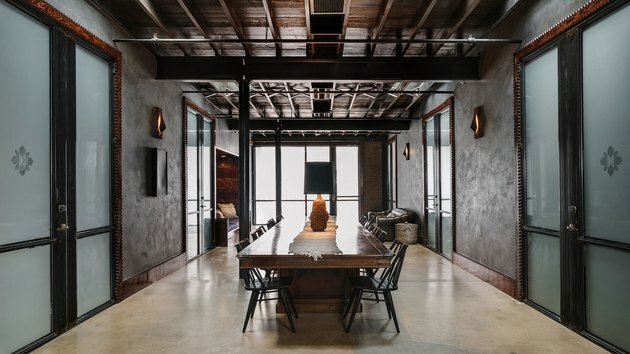 Working alongside Joel Mozersky Design and Icon Design+Build, Haas created a "dark and stormy" theme that balances period architecture and vintage pieces with of-the-moment elements and custom-made furnishings. "By merging all periods and styles, we feel that we have created something that is timeless," Has says. The team also never lost sight of the functional priorities of the space. "Music, art, food, libations, and social activity were always the primary drivers," Haas adds. The result — coherent, eclectic, historically grounded yet progressive — is, well, a lot like the city itself. "We wanted to preserve the existing building with minimal enhancements," Haas said. "There are future ambitions to create more garden-style cafe seating, patios, and a potential pool to engage more of the outdoors." 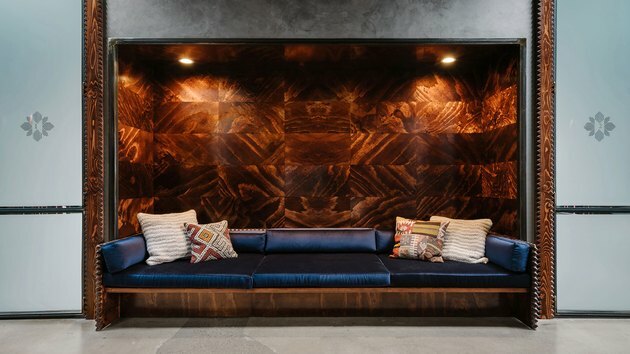 A dark wall behind a built-in sofa, which was custom built by Icon Design + Build, functions as a communal booth and sets a relaxing tone to the space. In the cafe, low-sitting chairs from Four Hands Furnishing Style provide the perfect setting for lounging with friends. 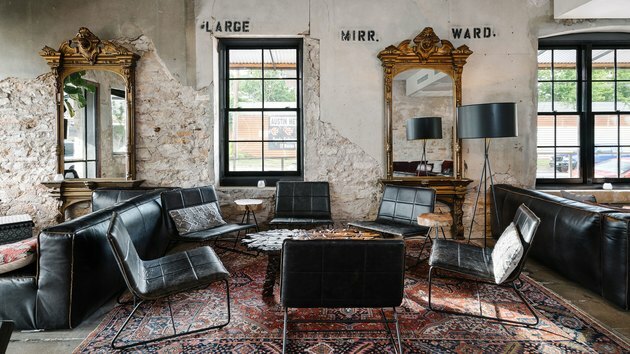 Vintage mirrors and local art bring more life to the exposed walls. And on the other side of the room, a mix of couches provide ample seating, while greenery adds more color to the space. Nothing makes travelers feel at home more than a kitchen that resembles one that could be in a family house. With custom cabinets created by Icon Design + Build and chairs from Industry West, the at-home experience gives visitors a place to relax. 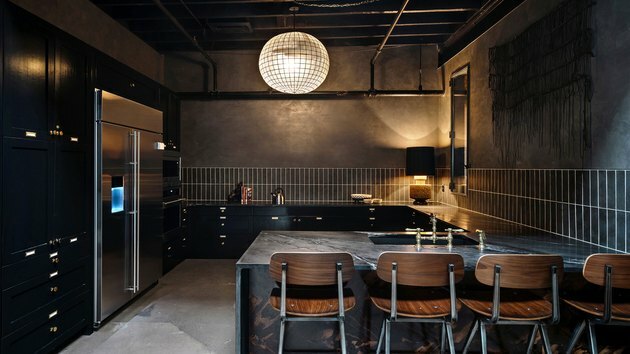 A unique round hanging light from Restoration Hardware provides just the right amount the mood lighting. 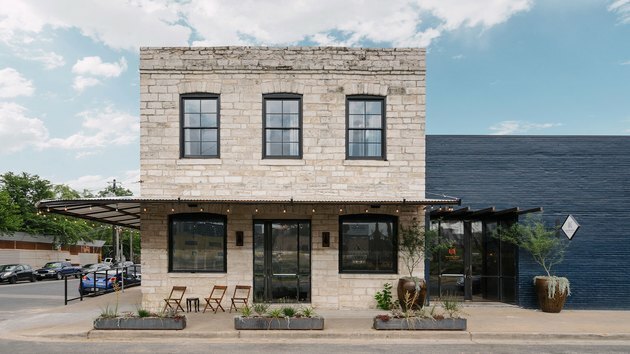 The unique bar was a project headed by Michael Dickson, a co-owner of Icon Design + Build. "We worked with him to come up with a layout concept that was based on a particular bar in Colorado that Michael loved," Haas remembered. 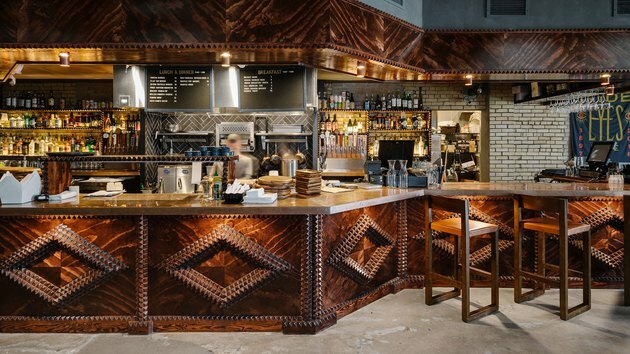 "He felt that this bar layout was very open and inviting and conducive for social interactions." 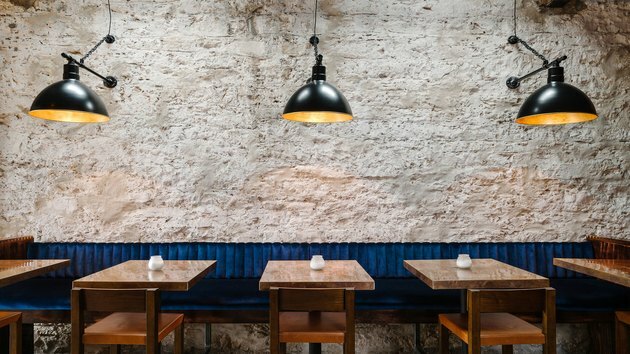 An original wall, elegantly lit by Barn Light Electric lamps, provides a backdrop for the bar space. A cozy booth with custom tables built by Icon Design + Built were paired with chairs by Williams Sonoma. 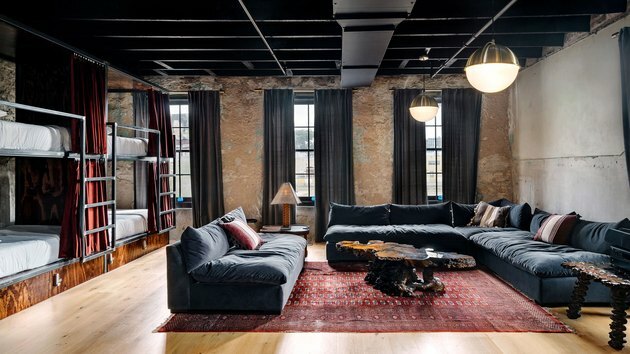 In an effort to preserve as much of the site's history as possible, the designers opened up the ceiling to allow for the original exposed beams to be seen. Dark curtains, a sofa by Four Hands Home, a hanging light by CB2, and a vintage rug provide an extra level of coziness to the communal bedroom. 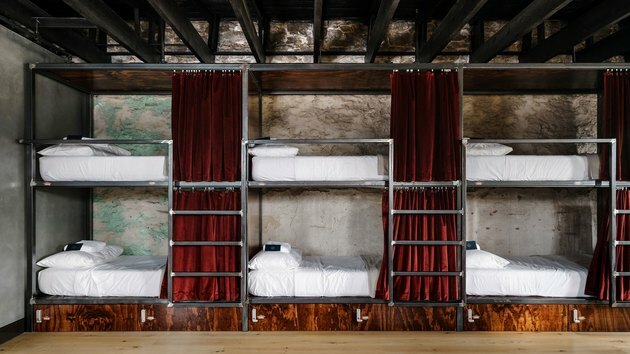 Custom-built bunk beds feature bedding by Peacock Alley and dark privacy curtains by West Elm. A vintage table is the perfect place for remote workers to hold a meeting or for new friends to have a chat.